After reading some article on “The Facebook” about building a garage with all the accoutrement needed to field a club race car, I’ve been dreaming about building my perfect garage. I drafted out some very basic layouts on graph paper, and even got a coworker to draft up a general estimate of costs (since we’re sort of in the biz). But today, I actually stumbled upon an awesome time waster resource. 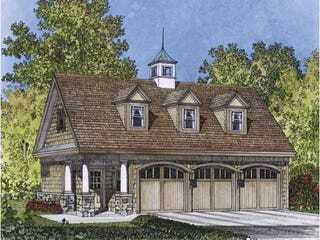 This site (eplans) seems to be mostly for purchasing plans for houses, but there’s a whole section for garages! I browsed through most of them, and started to get some really good ideas. Quite a few of them have an RV or boat area, but screw that…car lift and trailer! Design a little overhang on the side with a couple of trench drains to wash the car….oh man, it’ll be glorious. Most of these have a 2nd floor with a couple of rooms, kitchen, bathroom etc. You could actually live in these things. Unfortunately the plans and estimates are prodigiously expensive so I can’t get into the real nitty gritty. Ah well…now I just need to buy some cheap land in the middle of nowhere, and make this a reality. Maybe in 10 years.